Struwwelpeter (Slovenly Peter) is an illustrated collection of humorous children’s poems describing ludicrous and usually violent punishments for naughty behavior. Hoffmann, a Frankfurt physician, wanted to buy a picture book for his son for Christmas. Not impressed by what the stores had to offer, he instead bought a notebook and wrote his own stories and pictures. 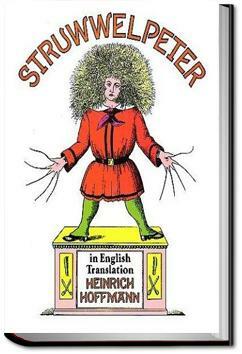 While Struwwelpeter is somewhat notorious for its perceived brutal treatment of the erring children. To see how Fred did scream and cry! His leg was very sore and red! I read these classic morality tales enough times as a kid that I knew large chunks by heart. But, let's face it, back then they were seriously out of date, and now they're so archaic that they aren't amusing even as kitsch. No wonder most children today haven't heard of them. Some kids might be a little traumatized with this book, but I dare say most would love it. All the things threatened to happen when children misbehave actually happen. It's a dark book but amusing in its own way.